Brilliant work. I’m curious how it performs for you. Have you thought about adding batteries? It works quite well. It even charges the onboard battery when driving at a reasonable speed (20 km/h). But I haven’t tested it with my new HTC Desire yet. This phone will consume a lot more energy and is known to even drain the battery when connected to a regular car charger (500 mA) instead of the HTC OEM version rated at 1 Amp. Adding batteries might be needed now. Could you mail me a pic of the bottom side of the printboard? And could you tell me to which pins of the USB socket I have to connect the + and ground? If I connect 4 AA rechargeables between the +ve and -ve before C4, will I be able to charge them from the hub and run my iPhone 3GS? Sorry to ask, but Ive been trawling sites for hours and my head is spinning! No, I wouldn’t recommend that. Well, first of all there is no protection against overloading. I also think it’s not very efficient to first load a battery, then use that battery to load another one. besides that, I think it might work. But I’m no expert on the subject. leuk ontwerp ! Maar ik kom er net achter dat ik een LM 2940CT 12 V ic heb. Ze bestaan in verschillende uitvoeringen, en ik moet dus de 5V hebben ..
Yep, 5 Volt low drop-out. For a garmin Nuvi 1000mA is required. Is there a simple modification possible ? 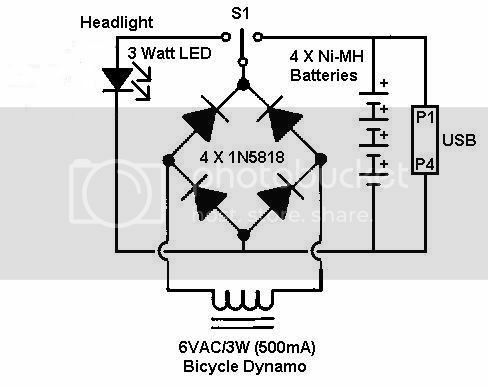 The hub-dynamo is the limiting factor, a 3Watt hub can only generate 500mA. Totally missed your reaction, do you still need it ? In the first paragraph I have a link to a step by step guide for building this. It shows you how to connect things up. I have a Garmin eTrex 20 that has a pretty decent battery life (I get about 23 hours with the backlight off on a pair of cheap AA batteries) It will run off of USB power, but once that power is removed, it will automatically shut off versus switching over to the on-board power. Would adding a decent sized capacitor in series with the USB load help alleviate the on-off associated with stop and go biking? My EE knowledge is rusty at best… I just enough background to get me into trouble. Hi, why are you only using low esr capacitors for C2 & C3? Would it be unstable when using only low esr?